it is finally finished! i thought i had it done at about 7:00pm last night, but had this nagging feeling it wasn’t quite right. so, sent a picture to my brother – sure enough, he pointed out what he thought it needed and it coincided with my own thought. so, after midnight i at least pinned on the final two pieces. 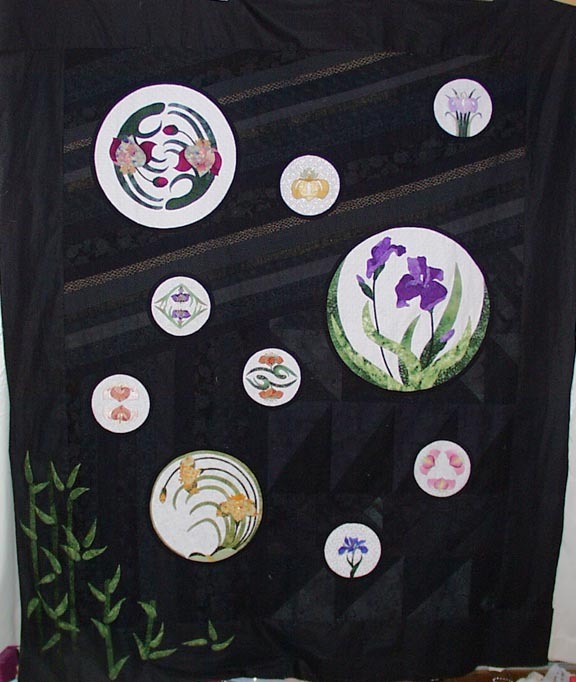 the picture below does not include those as in order to get another picture of the whole quilt – well, have to drag it up to the big house, along with a collection of pants hangers – and hang it from the drapery rod. trouble is it is bright outside, so even with the drapes closed i would get light coming thru that would show all the seam allowances in the pieced background etc etc etc. this is close enough. i will have a good picture taken once it is quilted and bound! speaking of that – the tickets have been printed and are available – just in case you want one (or 6) ^_^. and now i will call sandy. i’m sure she will be quite relieved to hear the news. will arrange to meet her at high sierra to purchase the black batting and let her see the finished product. may give mary a call today and if she is at home, take it on over. she is the show chair, so it is officially ‘her’ quilt. and the whole asian theme was her idea. oh, i guess the name of it will be “asian (iris) moons” ^_^ still have the backing to cut and piece. am considering asking mary to do that????? i am furnishing the fabric. i know it’s dark. we turned on every available light.